Despite their growing numbers in the U.S. population, Latino voters turn out in notoriously low numbers on Election Day. WYPR went looking for Latino voters at polls on Tuesday to see who showed up and who they voted for. There’s a large Latino community in College Park and a few of them showed up at Hollywood Elementary School to vote in Tuesday’s midterm election. “Oh yes. We’re taking the country back obviously,” says Raul Torrento who braved the morning downpour to be there at 8 a.m. with his four-year-old son to vote straight Democratic. His vote appeared to be as much about national issues, where President Trump has been stoking resentment of immigrants, as about local issues. “You know I don’t want my son to grow up in a country where he doesn’t feel safe, just because of what his last name is or who his parents are,” said Torrento. Many Latinos in College Park echoed Torrento’s sentiment. Aparisio has lived in the US for 38 years, been a citizen for 32 years, but this is only the second time he’s voted; straight Democrat as well. It was the same for Naticia Najera, who also has lived in the US for more than 30 years. “I don’t like a lot of the Democrats because they are too liberal, but with that new president it was better to vote Democrat instead,” said Najera in Spanish. Nationwide more than half of all Latinos who are eligible to vote said they were more engaged in this election than the 2014 mid-term election, according to Pew Research. But in Southeast Baltimore, another area with a large Latino population, almost no Latinos showed at the Southeast Anchor Library or Hampstead Hill Academy. And the only Latina wouldn’t speak on the record. Antonio Ugues, professor of Latin American Politics at St. Mary’s College of Maryland says neither the Latino turnout, nor their voting pattern is surprising. 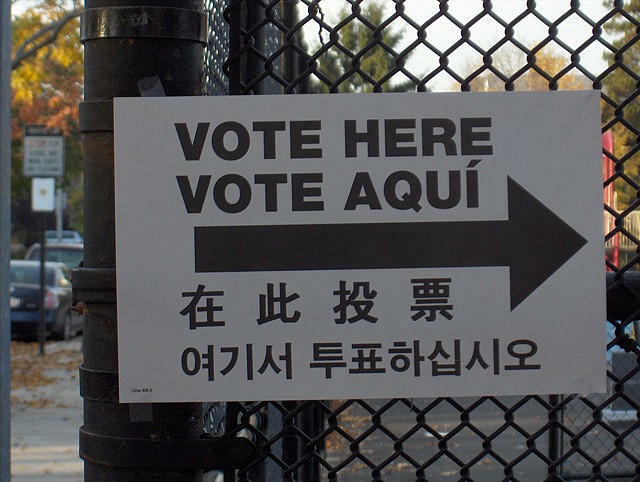 Indeed, Latinos make up only 5.3 percent of the voting population in Maryland, according to Pew Research. But its’ unclear how many of them actually voted Tuesday. It’s a windy autumn Saturday at the Bladensburg Festival del Rio, an annual event for environmental groups to entertain and educate Latinos about environmental issues. There are tents set up with different activities for kids, a live band, and kayaking rides on the Anacostia. I’m here to ask Latinos voters how interested they are in the upcoming midterm election. Bayardo Lune, sits in the shade about to enjoy his lunch. He came to the US 20 years ago from Mexico and says he’s not sure if he’s going to vote on Tuesday. It’s afternoon rush hour on a Friday in the parking lot of Columbia’s Dobbin Center. Jonathan Hernandez and his Casa in Action canvassing team are starting their shift. It’s one of two teams working Howard and Anne Arundel counties.